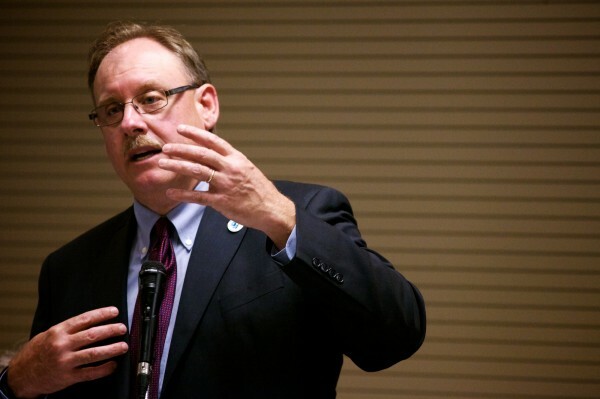 Curt Spalding, New England regional administrator of the U.S. Environmental Protection Agency, talks about clean air and global warming in Portland. PORTLAND, Maine — Dr. Tony Owens stood before a federal environmental regulator Wednesday and described his most recent shift in the emergency department at Maine Medical Center. “I worked my shift in the ED yesterday and admitted three people with respiratory problems: an asthmatic, a COPD patient and a young woman with cystic fibrosis,” Owens told Curt Spalding, New England regional administrator of the U.S. Environmental Protection Agency, who visited Portland to gather feedback about the federal government’s new proposed limits on carbon dioxide pollution from power plants. “Why are you sicker today?” Owens asked the three patients. “The air is bad,” they said. Owens was among 18 speakers who commented on the new carbon limits during the informal listening session, which touched on pollution’s wide-ranging effects on human health, the environment and the economy. All of the speakers at the hearing, which drew about 60 people to the University of Southern Maine’s Wishcamper Center, supported the new limits, though some urged regulators to go further. The proposed rule, outlined under the Clean Air Act in the EPA’s “Clean Power Plan,” aims to set the nation’s first-ever limits on carbon pollution, much like the agency already caps other emissions such as mercury and sulfur dioxide. A cornerstone of the Obama administration’s strategy for combatting climate change, the rule targets existing fossil fuel-fired power plants, which represent the largest source of carbon dioxide emissions in the U.S. The plan provides each state with a goal for limiting carbon emissions from power plants, with interim standards kicking in by 2020 and full compliance in 2030. The EPA wants Maine power plants to reduce emissions by 13.5 percent in the next 16 years. If adopted, the limits would put the country on track to slash carbon pollution from the power sector by 30 percent by 2030, according to the EPA. That’s equal to taking roughly 150 million cars off the road, or nearly two-thirds of the nation’s passenger vehicles. The EPA proposed the new limits June 2 and is seeking public comment. Several speakers noted that Maine and New England are well positioned to meet the EPA’s goals, after establishing carbon pollution limits under the Regional Greenhouse Gas Initiative in 2009. Under the initiative, power generators that emit greenhouse gases pay for emission allowances in a regional auction. The money generated funds efforts in energy efficiency and emission reduction, such as home weatherization. The energy savings total $257 million to date. Detractors, including business interests, argue the new rule would harm the economy, reduce the country’s overall electricity production capacity and hamper jobs and production. Officials with the Maine Department of Environmental Protection have said flexibility for states — an aspect of the plan Spalding emphasized Wednesday — is a top concern. The EPA has identified four Maine power plants subject to the proposed rule: Wyman Generating Station on Cousins Island in Yarmouth, Maine Independence Station in Veazie, Rumford Power in Rumford and Westbrook Energy Center in Westbrook, according to Maine DEP. The EPA estimates the plan will lead to $90 billion in health benefits — preventing up to 150,000 asthma attacks in children and 6,600 premature deaths — based on expected improvements in air quality. “We believe very strongly that once you start doing this work the rest of the country will learn what we’ve learned in New England: that this is not only good for our health … it’s good for our planet. But it’s also good for us, our economy,” Spalding said. Nick Battista, marine programs director at the Island Institute, warned of the effects of pollution-driven climate change on Maine’s fisheries, including the lobster industry. Waters in the Gulf of Maine were three to five degrees warmer in 2012 than historical averages, followed by a return to normal temperatures last year. The warmer water spurs lobsters to shed earlier, leading to price collapses and variation that catches lobster fishermen by surprise, he said. Tom Peterson, a Windham designer and builder of energy-efficient housing, supported the proposed rule but urged the EPA to focus more on reducing consumer demand for electricity produced by power plants. Residential and commercial buildings account for 40 percent of the country’s energy use, he said. The EPA will accept public comment on the proposed rule through Oct. 16.